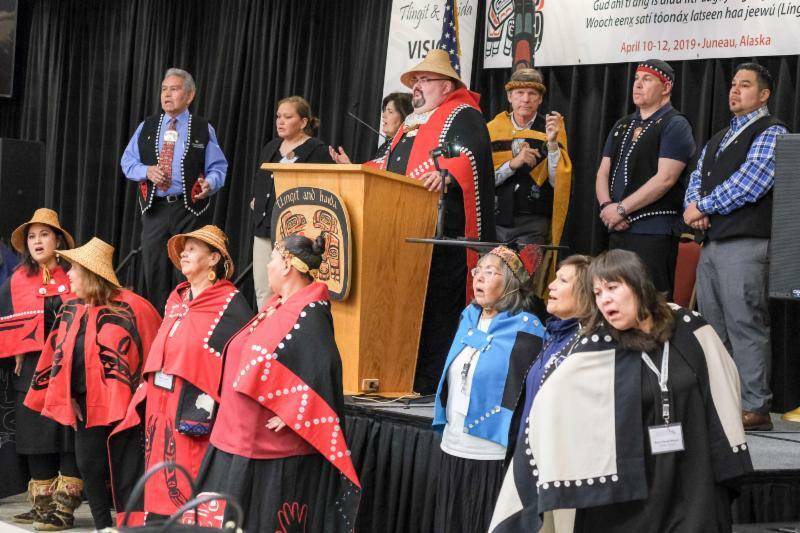 Juneau, AK (April 12, 2019) – Central Council of Tlingit & Haida Indian Tribes of Alaska’s (Tlingit & Haida) 84th Annual Tribal Assembly convened on April 10, 2019 at the Elizabeth Peratrovich Hall in Juneau, Alaska . Delegates gathered to conduct the business of the Tribe, hear reports, discuss issues and take action on resolutions – 99 of 110 Delegates were present. The day before Tribal Assembly, Delegates had the opportunity to participate in a Robert’s Rules of Order and Civics training, receive an update from the Tribe’s Violence Against Women (VAW) Task Force and attend a VAW Rally. This year’s Tribal Assembly embraced technology and replaced traditional three-ring binders with Samsung tablets – agendas, resolutions, governing documents and presentations were made available through a meeting application. The Southeast Alaska Native Veterans led the grand entrance with the posting of the colors followed by President Richard ( Chalyee Éesh ) Peterson, six Vice Presidents and Delegates dancing in with the Xáadaas Dagwíi dance group. During the opening ceremony, Delegates were introduced to Tribal Host James Price and Tribal Hostess Cheryl Dodson, both of Washington. The Tribal Assembly also received opening remarks from Alaska Governor Michael Dunleavy and special welcomes from state, local and tribal leadership. With the theme, “Through Unity We Have Strength,” e ach day ‘started in a good way’ with special music provided by Petersburg Delegate Nathan Lopez and a Word of the Day in Lingít Yoo Xʼatángi, Xaad Kíl and Sm’álgyax provided by Anchorage Delegate Shirley Kendall, Hydaburg Delegate Lisa Lang and tribal employee Alfie Price. Reports were also heard from Tlingit Haida Tribal Business Corporation (THTBC) Chief Executive Officer Richard Rinehart ; Tlingit & Haida’s Chief Financial Officer Theresa Belton, Tribal Court, and standing committees (Audit, Judiciary and Enrollment). In addition to hearing a report on the Language program, the Audit Committee shared that the Tribe’s audit had no significant findings for its seventh year in a row. Delegates also received a special address from the Assembly of First Nations’s Regional Chief Kluane Adamek and an update on legislation for the landless communities of Haines, Ketchikan, Petersburg, Tenakee and Wrangell from representatives on the Southeast Alaska Landless Corporation (SALC). Delegates reviewed and adopted proposed amendments to Statute Title 15 – Enrollment, which codified existing procedures and updated practices in others, one of which removes listing blood quantum on tribal identification cards. A total of 31 resolutions were acted on – 17 were adopted via consent calendar, 5 were adopted through committee referrals, 6 were ruled out of order, 1 was withdrawn, 1 failed, and 1 was tabled. A full listing of resolutions will be made available on Tlingit & Haida’s website. In closing, Delegates will gather this evening for the President's Award Banquet & Language Fundraiser to honor a handful of those who have contributed greatly to our Tlingit & Haida people, communities and culture, and to support Southeast Alaska's indigenous languages.